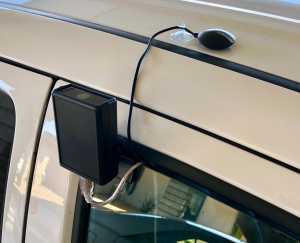 This should be useful for large land surveys where an SQM (-LE/LU/DL/R/V) and separate GPS are connected to a laptop computer while driving around collecting data for a dark sky map. Enabling the GPS from the Log Continuous page forces "MOVING" platform logged recordings that append five fields (latitude, longitude, elevation, speed, number of satellites in view) to each record. This feature has been tested with the GlobalSat BU-353 USB connected GPS which can be purchased from Amazon. Note: Many other GPS receivers that send standard NMEA messages at 4800 baud should also work. UDM Version 1.0.0.82 has a .dat to .kml tool (Tools->dat to kml). The kml file can be opened in GoogleEarth. GoogleEarth cannot read hidden directories, so you may have to move the newly created .kml file to an easier-to-find location like the Desktop.